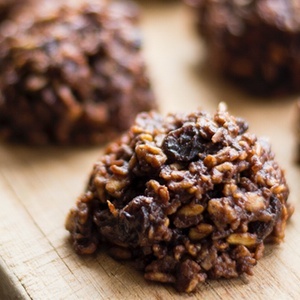 Using pre-soaked and dehydrated oats and whole sweetener, my friend Regina made over the traditional oatmeal no-bake cookies recipe to be healthier. I called her the other day and begged for it — my kids were desperate for a snack and I was short on time. These cookies fit the bill, deliciously! Regina makes her cookies with natural peanut butter and carob powder. I used almond butter and cocoa powder. Either way… yummy! 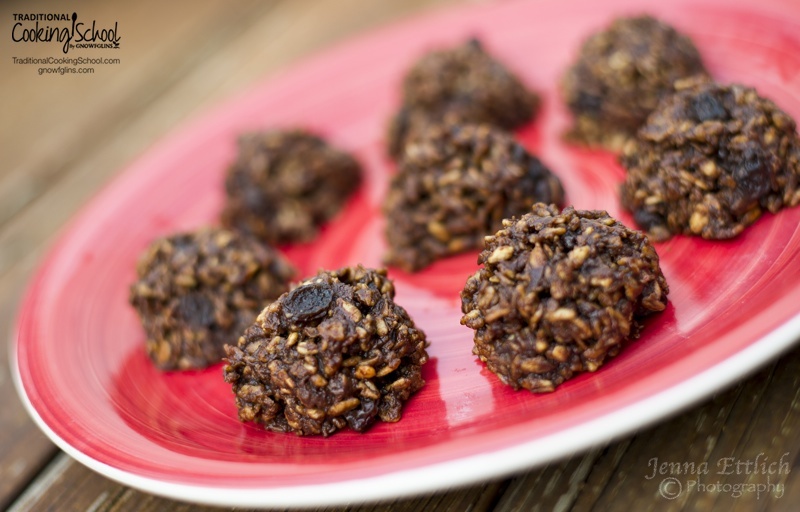 My friend Regina made over the traditional oatmeal no-bake cookie recipe to be more healthy. I called her the other day and begged for it -- my kids were desperate for a snack and I was short on time. These cookies fit the bill, deliciously! This is a double batch and makes about 4 dozen+ huge cookies. In a large pot combine Rapadura, water, carob powder (or cocoa powder), vanilla extract, and coconut oil. Place pot on a burner over medium heat. Bring to a boil and let boil for 2 minutes, whisking the entire time to prevent burning and to ensure the coconut oil melts and mixes in well. Add rolled oats, nut butter of choice, shredded coconut, and raisins. Mix well. Mixture should be thick but stirrable. It will harden as it cools. Drop by heaping spoonfuls on to cookie sheets. They will cool quickly and can be eaten in just a few minutes. Enjoy! *To reduce the phytic acid in oats, start by soaking and drying your oats a few days before making these cookies. Soak 10 cups of thick rolled oats overnight in water to cover (and then some) along with 1/2 cup of raw apple cider vinegar, sourdough starter, kombucha, kefir, yogurt or other acidic and/or cultured liquid. Use a slotted spoon to transfer the oats (let the liquid drain out first) in thin layers on dehydrator sheets and dehydrate at 115 degrees Fahrenheit until dry and crisp (you can find detailed information on my method for pre-soaked oats at this #AskWardee). Then proceed with the recipe. 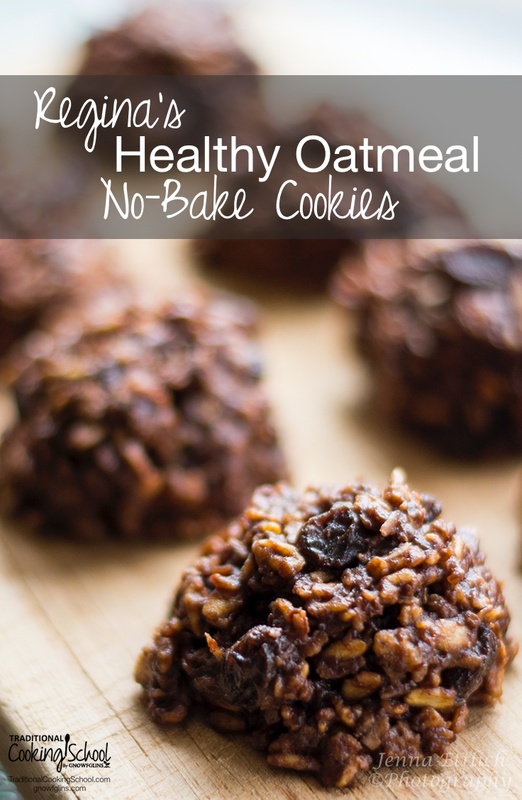 Enjoy and be sure to let us know if you like Regina's healthy oatmeal no-bake cookies! 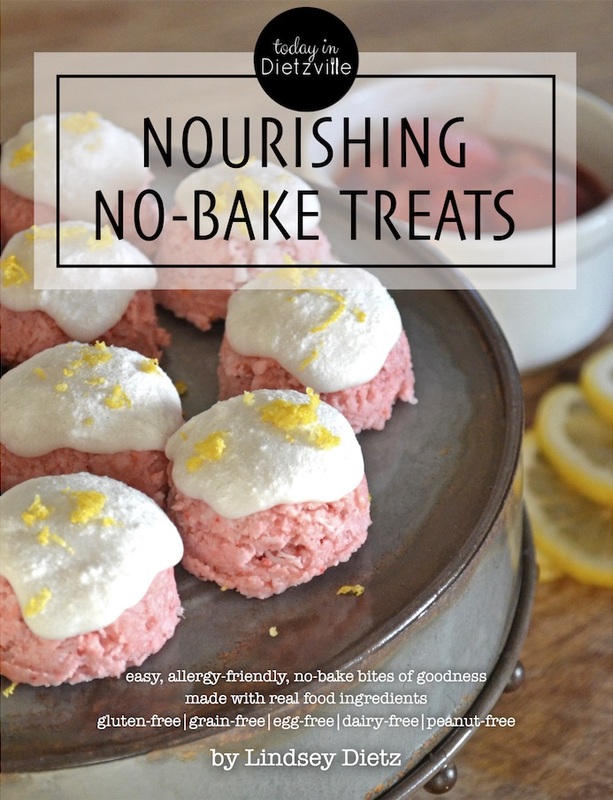 This post was featured in 44 Egg-Free Cookies That Are Crazy Good and 49 Nourishing No-Bake Cookies and Bars. 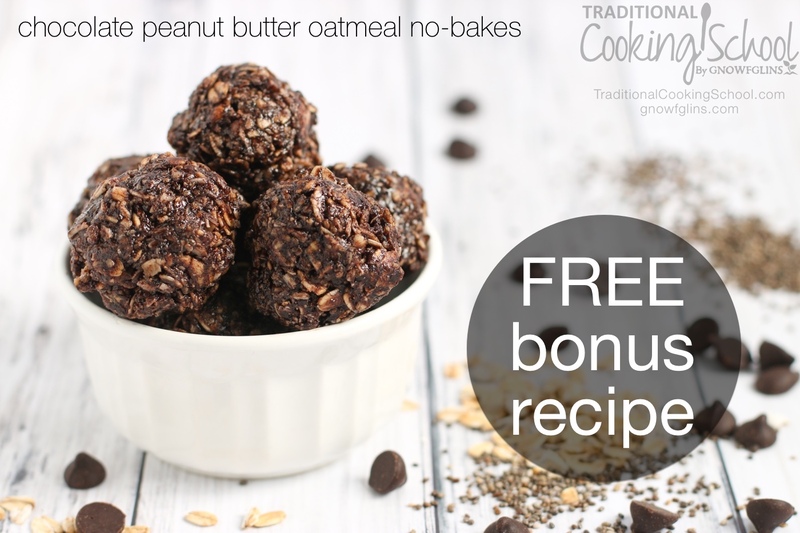 Want More Nourishing No-Bake Treats? Oh my goodness. Thank you, thank you, thank you! Awesome recipe! Perfect for hot summers! I don’t have Rapadura, do you think it turn out the same with brown sugar? Jen, I would think so. Rapadura is evaporated cane juice, which is usually available in bulk at a health food store. I think the original recipe called for white sugar. Have fun with it! I make these often, using honey! Delicious! Tiffany, do you make any adjustments with honey, then? Since it is a liquid sweetener, would you reduce the water? Thanks! Could you start by leaving out the water, then start with 1 cup of honey and adjust to taste? These look yummy! I think I will try them but soak the oatmeal first. I’ll report back how they turn out. Yum! I had to comment so I get the update when someone soaks the oats first. I’ve been experimenting with soaked oats as breakfast cereal/snack bar and they come out good but I make it in the dehydrator and it takes about 18 hours to dry. I’m trying these tomorrow! Sustainable Eats — have you been able to try these with soaking? Everyone — I updated the recipe, as I am now adding shredded coconut and raisins to the cookies. I just made these and they are sooo yummy, but mine are very pliable and gooey. I used cocoa powder, 7c of oats, and 1c of coconut. My penut butter seemed oily. I am thinking I should up the cocoa powder, what do you think? I think I’ll stick um in the freezer and see what happens. We ended up with a couple gooey batches. I have added up to 8 cups of oats. But are you making sure you boil for a full 2 minutes? I think there are variations, depending on the thickness of the oats and the composition of the nut butter. With my homemade peanut butter, I can only add 6 cups of oats. With almond butter where I’ve added a bit of water to help it grind, I have to add 8 cups of oats. With almond butter where I add a bit of oil to the grinding, I add 7 cups of oats. … I’m sorry they turned out gooey. It does take a bit of experimenting. Keeping them in the fridge will help with being able to eat them, but keep them uncovered so they can dry out a bit. They hardened up great in the fridge. How do you store yours? You know, the gooey ones were actually good like undercooked brownies. I do think if I had added more oats that would have fixed it. I tend to want to follow recipes exactly, so that I don’t mess them up, but I’ll never create my own recipes that way! I am glad they hardened up in the fridge though, because I would like to include them in Hubbies lunch. We stored the gooey ones in the fridge. They hardened up in the fridge if I left them uncovered (which I did out of laziness and then saw the benefit!). The cookies that hardened well from the beginning, I stored in airtight containers on the counter. We ate them within a few days. Have fun – now that you’ve made the recipe once, you can experiment the next time! Just a note to everyone — I have reduced the Rapadura down to 2 cups, and I think it can go lower. The cookies are still plenty sweet. I bet that soaking/dehydrating/pulsing the oats would work for this recipe, too. Maria – I agree! The last time I made these I cut back to less than 2 cups of sugar. I’m glad you enjoyed them! I agree that almond would make them delectable! Thanks for sharing your tips and experience with the recipe. This is similar to my recipe I have converted, but you have a coconut oil twist in it that gets me exicited. Can’t figure out why I haven’t thought of that before. LOL I can’t wait to try. One thing though, isn’t it better to put the vanilla in at the end so it doesn’t evaporate away during the two minutes of boiling? I think I will continue to stick it in at the end. Thank you for great recipes. Alicia – I think you’re right. That would be good to wait on the vanilla. 🙂 Hope you enjoy the coconut oil twist. One more thing, has anyone ever experienced their gluten free rolled oats as seeming to go rancid after they have been made into cookies. I have not made any cookies yet that haven’t smelled and tasted terrible if we leave them on the counter for even a day. It is baffeling to me. Alicia – I’ve never heard that nor have I experienced it, but I also have not bought the GF oats ever. I wonder if anyone else knows? Do you refrigerate to prevent this? Either I refrigerate or freeze as I only have one child who is gluten free and his cookies simply taste different and no one really likes them. I can’t understand why oats that I thought were merely not processed on equipment that also processes gluten grains would be so awful tasting. Although I tried eating a bite of the oats raw and they tasted fine. Weird I know. Maybe someone else has an idea. 1) The phytic acid in the oats is neutralized – ensuring maximum mineral absorption. 2) The enzyme inhibitors in the almonds are neutralized – making the almonds an excellent source of digestive enzymes! I haven’t made this recipe yet but can’t wait to try it. As far as the rolled oats, I like to soak my oat groats overnight and then dehydrate them next day. After they are dried, I roll them through my flaker. I found this to be a lot easier then soaking already rolled oats but of couse, you would need a flaker to do it this way. YUM! We just made these cookies. I have a question about the soaked/dehydrated oats. What I ended up putting on my dehydrator sheets (after an overnight soaking of 10 c. rolled oats in filtered water & 1/2 c. ACV, covering the oats & then some) . . . was a pretty sloppy, chunky, soaked oat spread. When it was done dehydrating for about 20 hours, it was crunchy/crumbly and tasted good, but didn’t really resemble true rolled oats anymore. I crumbled it all up before putting it in the recipe. Hi, Jenna! Everything you did sounds right. However, if you start with thick rolled oats, they will more resemble the original rolled oats because they’ll hold up better during the soaking/drying out. Just a question on dehydrating soaked oats…I don’t have a dehydrator (yet! ), can I use the oven? I think the lowest my oven goes (digital) is 170 and I don’t want to be doing that now if i have to leave the door open to do it as it’s so hot these days! I’d like to do up a big batch this fall…how long will they stay good for? could i freeze them and keep them for several months like that? I have the same question Dawn! I have a dehydrator, but I just learned it runs at 150 degrees, no temp control. My oven only goes down to 175. I wish it had a warm setting. Did you try this? I was wondering if it works. When I soak oats I also add a tbsp or two of whole wheat flour bc oats don’t contain their own phytase to break down the phytates so the flour contributes that to it. Have you done this or heard that? this is really good if you add toasted nuts to it as well! I just made these (waiting not so patiently for them to harden) I cut the recipe in half and so far I would agree the sweetness could be reduced more( I love desserts but not to sweet). Half of it I added in sliced almonds and some coconut. I also added in 1tbls of pb2 for a bit more peanut flavor and protein. Thanks for the recipe. I didn’t soak my oats, I don’t have a dehydrator and I have not tried my hand at soaking grains yet.